We report a case of abdominal pain with rigidity, mimicking an acute abdomen, caused by metoclopramide, a common anti-emetic drug. Extrapyramidal symptoms are commonly reported side-effects of this medication. They generally include involuntary movements of limbs, torticollis, oculogyric crisis, rhythmic protrusion of tongue, trismus, or dystonic reactions resembling tetanus, etc. 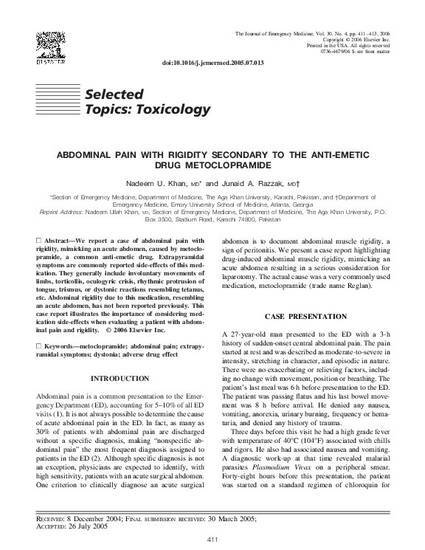 Abdominal rigidity due to this medication, resembling an acute abdomen, has not been reported previously. This case report illustrates the importance of considering medication side-effects when evaluating a patient with abdominal pain and rigidity.